Train users hoping to travel to and from London over the August bank holiday weekend are being warned to plan their journeys now as a major London station is set to close for engineering works. Network Rail is warning passengers that no train services will stop at London Euston on Saturday August 26 and Sunday August 27 and that a reduced service will run until midday on Monday August 28 2017. A full service is expected to resume from midday onwards. Services on the Saturday and Sunday will terminate at Milton Keynes and rail replacement buses will then run to and from Stanmore to connect with London Underground services on the Jubilee line. The rail infrastructure manager is also warning that services are expected to be busier than usual and London’s Marylebone, King’s Cross, St Pancras and Victoria stations will be more crowded than usual. More disruption is expected between August 12-28 for Northern users across the north west as essential work is scheduled to take place as part of the Great North Rail Project. Passengers are advised that the majority of train services will not run in or out of Bolton until the first service on Monday August 28 2017. 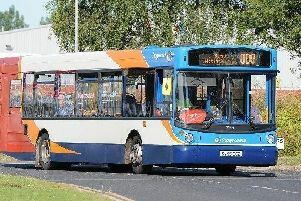 However, trains will still run from Bolton to Blackburn and Clitheroe during weekdays, but users travelling on from Bolton will be provided with a rail replacement bus. A spokesman for Network Rail said: "A large programme of essential work this August as part of our Railway Upgrade Plan will provide faster, more reliable journeys, with more frequent rail services. "Anyone planning to travel during August – particularly over the bank holiday (Saturday 26 August to Monday 28 August) – is advised to check their journeys on the National Rail website as early as possible. "While there is never an ideal time to carry out engineering work on the railway, our improvements programme takes place when the railway is quietest – up to 50 per cent fewer passengers travel on bank holidays and in summer." Manchester Airport – Preston and beyond: Trains will be diverted via Wigan North Western and will not call stations via Bolton/Chorley. Hazel Grove – Preston/Blackpool North: Trains will terminate at Manchester Oxford Road. Blackpool North/Preston – Hazel Grove: Trains will start from Manchester Oxford Road. Huddersfield/Manchester Victoria – Blackpool North: Trains will run between Manchester Victoria and Huddersfield. Additional shuttle train services will run between Blackpool North and Preston. Manchester Airport - Southport: Trains will be diverted via Atherton and will not call stations via Bolton. Southport/Kirkby/Wigan – Manchester Victoria/Stalybridge: Trains will run between Manchester Victoria and Stalybridge. Additional shuttle train services will run between Kirkby and Wigan (and vv), and between Southport and Wigan. Buses will be provided between Manchester Victoria and Bolton, Manchester Piccadilly and Preston , Manchester Victoria and Preston, Manchester Piccadilly and Hindley via Bolton, and Manchester Victoria and Hindley via Bolton. Manchester Victoria – Blackpool North: No train services. Additional shuttle train service will run between Blackpool North and Preston. Southport – Stockport and beyond: Trains will be diverted via Eccles and will not call stations via Bolton. Manchester Victoria – Wigan via Atherton: No train services. Buses will be provided between Manchester Victoria and Wigan via Atherton, Manchester Piccadilly and Preston , Manchester Victoria and Preston, and Manchester Piccadilly and Wigan Wallgate via Bolton. Huddersfield – Blackpool North: Trains will run between Manchester Victoria and Huddersfield. Additional shuttle train service will run between Blackpool North and Horwich Parkway. Manchester Airport – Southport: Trains will be diverted via Atherton. Manchester Victoria – Wigan via Bolton: Trains will not run. Buses will be provided between Manchester Victoria and Horwich Parkway, Manchester Victoria and Hindley, Manchester Victoria and Bolton, Manchester Piccadilly and Horwich Parkway, Manchester Piccadilly and Hindley, Manchester Piccadilly and Bolton, and Westhoughton and Daisy Hill (peak hours only).